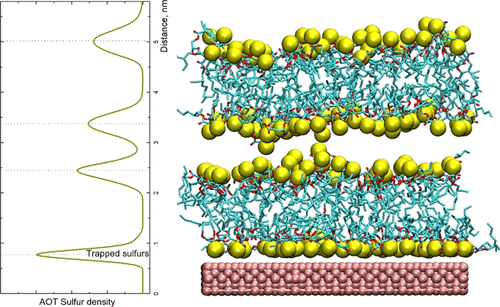 A molecular dynamics study was done to reveal the adsorption properties of sodium dioctyl sulfosuccinate (AOT) bilayers on gold Au(111) surfaces. Examining the rotational mobility of AOT molecules, we track that the correlation time of\\\\r\\\\nAOT molecules on the adsorbed layer is much higher. The data estimating the diffusive motion of AOT molecule show a substantially lower rate of diffusion (~10 -10 cm2/s) in the adsorbed layers in comparison to other ones. The results show that an adsorbed layer is more rigid, whereas the outer layers undergo considerable lateral and vertical fluctuations.